Four burners with independent front-mounted controls control the heat to different portions of the cooking grid. Pretty standard on most grills of this, type, it's still a nice-to-have. You can set one high enough to sear steaks and then shift the meat to the other areas for slow, precise cooking. Check on progress with the cover down, using the cooking thermometer in the grill hood. A welded stainless steel warming rack at the back keeps hot food warm while you finish the meal. Underneath the grid are four porcelain-coated heat reflectors, which keep drippings off the burners and radiate the heat of the flames evenly over the entire cooking area above. All these parts clean up after the cookout with a stainless steel wire brush. Two of the casters under the cabinet lock in place, so you can lock the grill in position for the cookout and then wheel the grill and the LP tank out of the way later. 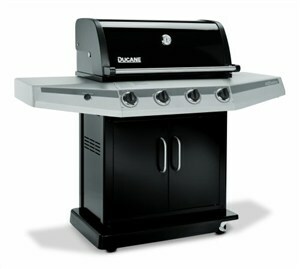 Again, pretty standard for a grill of this type, but definitely nice-to-have. Electronic ignition provides a dependable and safe start, but a metal match-holder lets you use the old lighting method if the ignition's batteries don't do their job. Stainless steel shelves on both sides of the burner area give you space for ingredients, meat fork and spatula, and a spot for plates when it's time to serve the hot meal. Warning: assembly is required. That shouldn't be too difficult, with a few common tools on hand. One more warning: unless you store the unit indoors, you'll need a weatherproof grill cover. The cabinet back has an open section for air flow to the burners and won't keep the rain out.